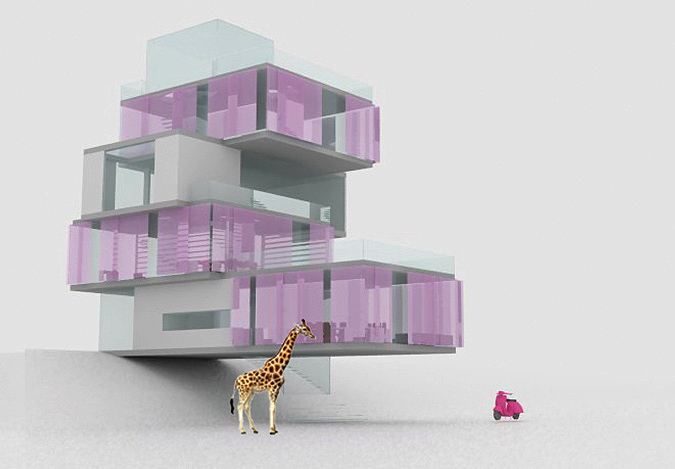 The aim of an AIA “Barbie Dream House Contest” is to inspire girls to become architects. The American Institute of Architects has announced the winner of its Barbie Dream House competition: a four-story, eco-friendly Malibu manse with signature pink sliding doors. The “California girl” translates to a 1,500-square-foot entertaining space and open chef’s kitchen, a separate library and client-meeting room, a full-floor “inspiration room,” a greenhouse on the roof, and a landscaped garden for a menagerie of pets. 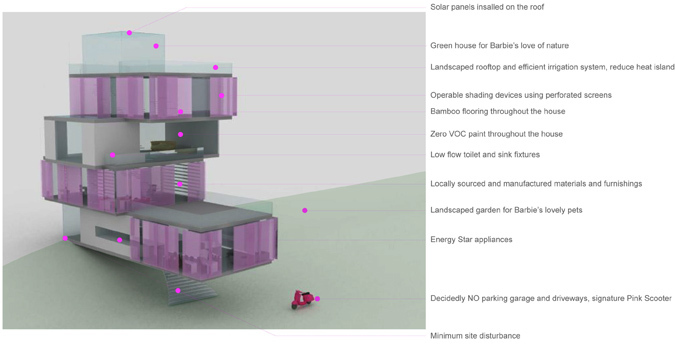 The USGBC part: solar panels, operable shading, bamboo flooring, low-flow fixtures, and locally sourced materials. Is this the house of an architect or a movie mogul? Mattel won’t be producing the house, nor will the architects receive compensation apart from a little press from outfits like this one. So what’s the point? According to AIA President Clark Manus, the intent was “to engage and inspire young girls to experience the world of architecture and the range of possibilities that design thinking offers.” Let’s leave aside whether a doll with impossible physical proportions can inspire anything but an eating disorder. The problem isn’t really getting women interested in architecture but keeping them in the white-male-dominated field. Unwittingly, the competition serves to spotlight one of the biggest obstacles facing female architects: getting their projects built.